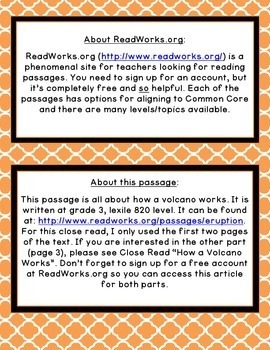 This product will help your students learn close reading habits with the help of a free article from ReadWorks.org. 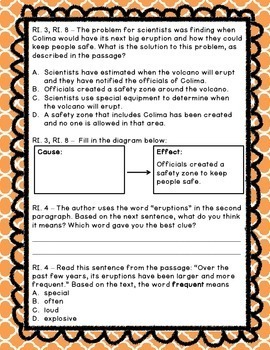 The questions included will help you conduct a close reading for this informational text. It covers all of the Reading Informational Text Standards for the Common Core Third Grade Standards. It is a mixture of multiple choice, short answer, and extended answer questions. The questions are provided, which takes the guesswork out of close reading and allows you to integrate close reading into your daily schedule. In order to do the reading, just print the article and questions for each student or group and start annotating this informational text. This would work especially well in an interactive notebook, so students can reference it in the future while doing close reading. This will also work as a class read, projected and read together, if printing is limited or not desired, with questions printed or discussed as a class. 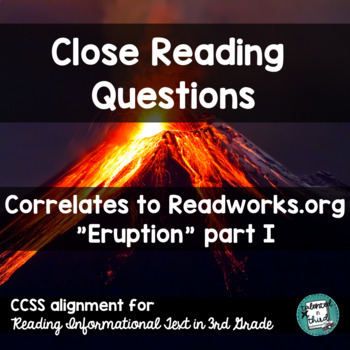 The close read questions included correlate to ReadWorks.org’s “Eruption” Part 1. This passage is all about how a volcano works. It is written at grade 3, lexile 820 level. This makes it an advanced individual read or a class/small group read. It can be found at: Eruption. For this close read, I only used the first two pages of the text. 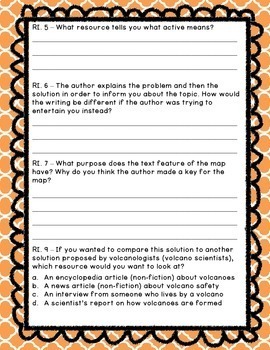 If you are interested in the other part (page 3), please see Close Read “How A Volcano Works”. This is all aligned to the Third Grade Common Core Standards, with a focus on asking questions that are aligned to the level of complexity the standards require. Many times, close readings will focus on the standards, but not at the right level of complexity, meaning students are answering questions below the level they need to. This practice doesn't actually help them develop the skills they need. These questions will help you to focus on asking the right questions, so the practice will match the end of the year assessment, as well as helping your students develop the needed skills to do well in the future.